Endeavor, I discovered my mistake: did not fully complete step 10. Had not installed files into System32 to make version 1809 work. Thank you so much for your instructions. I finally have Windows Mail running in Windows 10, after weeks of searching for a solution. P'm a happy camper. I am glad you worked out the instructions - good work, and you're welcome. I hope Patty (a few posts above) got it working too? ...it's always courteous to reply back letting us know how you made out. Maybe it's just me, but I think it's also courteous to click the Like button on the tutorials or any posts that helped you! And to all those in the future that post it's not working, we will simply say that it is ...proven many thousands of times already, you just have to follow the instructions in order and correctly, and you will be good to go ..that is of course minus the issues in the Bug List which are known, and so just be aware of them. My login in www.eightforums.com can be used on sevenforuns and Tenforums as a single login? Hello Shorty, and welcome to the Eight Forums! ..btw, I love your country! ...but Yes, you can use the same password for each one, however, you will need to signup and login to each account separately; iow, signing in to just one forum, does not sign you in to them all. There are the Vista Forums, the SevenForums, and here the EightForums, and then the TenForums ...all are part of the same group of forums, and have the same Administrators, but they all have a Separate login. ....does that answer your question? fwiw, I use the same password for each one, just because it makes it easier for me to remember, but I have to sign in to each one separately. Latest part of my effort to install Windows Mail in Windows 10: Although WinMail now runs, I get an error on startup. Get an error number 0x800C013E when attempting to download messages from my email account on gmail. The WinMail email account settings have been checked many times and nothing seems to fix the problem. Also tried turning off firewall and antivirus software with no effect. Any ideas out there? Would be much appreciated. I should have said when attempting to connect to my gmail account server. Assumed error occurs when downloading. Don't really know what is happening. You got me there. I never have connected WinMail to my yahoo or gmail accounts or any other account ever, I just use it by itself, and so unfortunately I can't help you with that one, sorry. However I see searching Google which I am sure you did already before you posted ? ..gives a hundred hits, mostly with Live Mail though; I suppose in some fashion may be releavant, but use discernment here. Remember though WinMail was created in 2006 and is much older technology and so don't expect it to necessarily work in all instances with the latest 2019 online offerings. Thanks for your comments, Endeavor. BTW, the Windows Mail folder contains the same files that are used in my Windows 7 laptop. The program works just fine in Win7. 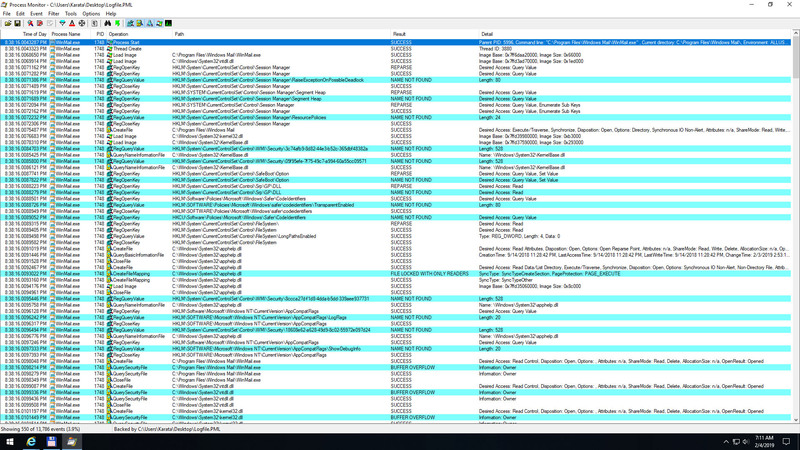 So I suspect a difference in system files between Win7 and Win10. But that's like finding a needle in a haystack. WinMail in Win7 connects to my gmail account with no problem, so I expect the same under Win10. I did a google search as you did and came up with the same results. Not much help. Anyway, the scope and purpose of this tutorial is specifically to help people get the base structure of WinMail setup, not to set up accounts, etc. Besides, since there are so many websites out there from back in that time-period of Vista Windows Mail (which this is Vista Windows Mail) ..that have covered all this account setup so very well, even our own sister Vista Forums, and so it's not for this tutorial here to do. The only mission here is to help get WinMail base structure re-instated, and the rest is the normal account setup procedures (which honestly sometimes is harder or at least more tedious). I suppose at some point in time, newer online email capabilities may not be compatible with the older 2006 style that Vista WinMail has within it. I am assuming you do not have Windows Live Mail installed at any point? ...or anything else for that matter. After you have made sure you've done everything right (don't assume you did) ..but if it still does not work, then Please check around and when you find the answer for your particular issue (the answer is there) ...then please come back and detail it. I do sincerely wish you success and I am rooting for you! Thanks so much for your excellent and knowledgeable remarks. I now appreciate how important it is to remove the files from the Program Files/Windows Mail folder and replace them with the original Vista files. Do I need to do the same with the appdata files contained under my user account? Will a WU change any files in WM folder under User/AppData? Also, in step 10 you provided three files which were inserted into the System32 folder. It was those 3 files that actually got my WM up and running! Perhaps I should use a strictly POP3 account from a different email client instead of gmail. However WM works fine with gmail under Win7 (so far). The reason I'm going to this trouble is that MS will discontinue support of Win7 a year from now. (Perhaps that is a good thing. No more updates!) Unfortunately, 3rd party vendors will also stop supporting software written to run on Win7. Trying to get optimal OS version for my new PC (H310 chipset - does not like my favorite Windows 7), I installed Win10 LTSB 2016 (1607). Unfortunately Windows Mail didn't start. Then I tried also with LTSB 2018 (1809) - same result. I needed "lightweight" OS so I used NTLite for both versions. Then I found this tread, claiming that Windows mail component must not be removed. But in both Windows LTS... versions I didn't see such component. Can anyone please confirm that Windows Mail works on LTSB/LTSC versions? Or I must use standard version just to get my favorite mail client working...? To all of your questions, the answer is, follow the complete instructions on post 1 & post 2 (read all spoilers too) and the instructions will solve all problems of "Reinstating WinMail"
If you more intricately needed to carry over your message store folder (which includes all of your accounts, etc, etc) follow the instructions as listed, and I even hinted about ideas to you in my above post. Your gmail account should have also been carried over along with it (except for the login passwords) all of this is meticulously explained already in posts 1 & 2 ..Read it! Always use the attached files on posts 1 & 2 as indicated. I don't like getting involved with helping people setup their accounts because I have enough to do, and as I said since it's already given on so many sites out there, then why should I parrot it. I'm not going to. WinMail users can at least research that out. However, for you, just in case something broke with gmail and WinMail on the latest Win10, i at least need to know about it. ...I did not want to do it, but I took the time on Sunday today anyway just to know for myself the answer. So, I did already have an old gmail account I had not checked messages in a month. ...and mind you, this was the First Time I Ever setup a gmail account to access on my WinMail ..! I slid my chair over to my Win10 1809 tower latest install, opened WinMail.. I followed the instructions with every thing, every tab, and did what it said to do, every detail, and when finished, I clicked WM to receive any messages from that old gmail account, and bingo, 13 messages came in...! So, gmail works just fine with WinMail on the very latest version of Windows 10 ! I installed Win10 LTSB 2016 (1607). Unfortunately Windows Mail didn't start. Then I tried also with LTSB 2018 (1809) - same result. Your English is just fine actually, I would of never known if you did not mention it. Yes Windows Mail works the same way on LTSB as with any other Win10 versions. The last time I installed and tested Enterprise LTSB was v1607 so I know it works fine. I have not updated that LTSB since then (it's not really a version I want) but I suspect with the success had with all other newer versions work fine with post 2 applied, so newer LTSB (or now LTSC) versions should work just fine too, but until I actually install and test it myself to make sure, I personally can not say 100% yet. The reason why WinMail would not start for you can only be because of not following the instructions properly - However, if you used NTLite first, well I don't know the answer because I've never used it, but thanks to you pointing to the post Saaglem showing it's true - so we will believe him. I do not know why you did not see Widows Mail listed in NTLite when you used it on LTSB, so you'll need to investigate it more. I do know that installing Enterprise 1607 LTSB without having used NTLite, WinMail has worked for me. ..edited to correct my wording.. I've just reinstall (64-bit) Windows 10 LTSC (1809) starting from untouched .ISO file, using Rufus 3.4 (just changed the partition scheme from GPT to MBR). I didn't use NTLite. After setup I followed the guide in first and second post, but with no luck - Winmail didn't start. I believe that I followed the instructions properly. I even used the link for the mentioned "Take ownership" .REG file (usually I used my own). - In point 6 is written "copy/paste your Windows 7 * ''C:\Windows\System32\msidcrl30.dll'' file over to Windows 8/10/Server same", but there wasn't such file in the fresh installed OS (I copied the file, but it didn't overwrite anything). - On the other hand, I have a file "c:\Windows\SysWOW64\msidcrl30.dll"... Maybe I have to replace this file? Or not? Nice nickname, by the way - that's the name of my PC Actually all of our family PC's are named after shuttles, just because... they're Shuttle's (XH61V, XH87V and XH310V - the last one is the problem, because of the stupidtrange decision of Intel/MS not to allow Windows 7 installing on H310 chipsets). Good Evening Krum, and your welcome..
~ I always use MBR too even though I can use UEFI on my towers, but I prefer MBR at this point in my life for a number of reasons. ~ . . . and yes the directions Are Accurate! ..there is no need to deviate. After setup I followed the guide in first and second post, but with no luck - Winmail didn't start. Well, you better do it again and follow the directions better this time, because WinMail does work on v1809 LTSC ! I just took the time and installed it myself tonight, i followed my own directions, and here are the screenshot results below. Installed LTSC > File Explorer options > Show hidden files... and Show extensions... > Downloaded and merged Add_Take_Ownership_to_context_menu.reg > Right click - Take ownership on C:\Program Files\Windows Mail\ folder > Deleted the folder > Unpacked the content of (x64)WM_ProgramsFolder.zip (a folder "Windows Mail") to C:\Program Files\ > Unpacked the content of (x64)msidcrl30.dll.zip (a file msidcrl30.dll) to C:\Windows\System32\ > Unpacked WinMailEdit.reg.zip and merged the .REG file > Unpacked Update_5-2018.zip and used \Update_5-2018\x64 msoe.dll\msoe.dll file to overwrite c:\Program Files\Windows Mail\msoe.dll (there is such file there because of the point 4, right? / I did not copy \Update_5-2018\x86 msoe.dll\msoe.dll to c:\Program Files (x86)\Windows Mail\) > Downloaded and extracted x64-System32.zip and copied the content of x64 - System32 folder (two files and a subfolder) to C:\Windows\System32\ > Downloaded reg_v1709+.zip and merged the .REG file inside > Downloaded 5-2018_UpdateReg.zip and merged \5-2018_UpdateReg\1709+Update.reg. Not sure if this can be helpful, but I started Sysinternals Process Monitor, filtered by process name (winmail.exe) and tried to start Winmail.exe saving the log. Process monitor native logfile .pml, archived is attached. Also here is a sample screenshot with marked "not-success" lines. Now I have to go to work... Have a great day! Don't feel stupid or less-than for anything. You have more computer knowledge/experience than the average person. I don't need to look at your screenshot, or your log file, or process monitor - your resolve is much easier than that so don't make things more complicated than they are, because it's very simple if you do the steps (and what's in them) correctly - it will work and in the end you will smile at yourself for what it will turn out to be a simple easy thing you've missed - I've seen this scenario play out more than a thousand times. Instead of spending all the time and effort to explain all of what you did, instead put that effort into whatever the smallest detail is that you missed in the instructions. Mostly over the years for x64 users, people use the wrong programs folder (Programs Folder (x86)) ..as already explained in the steps; or, they do it right, but then shortcut from the wrong folders WinMail.exe, or they mix up the attachments labels using the wrong files for the wrong place, or use the wrong x86 or x64 version of the files. All of this is mentioned in the notes. Do nOt extract any zip directly to the targets, extract them Before you get there is the best practice - because, I've seen what many people will do, will extract to a folder within its same name folder (instead of extract here) ..and so therefore you end up with doubled nested/named folders - and of course then you'll lose your true file/folder location targets. It's going to end up you did something like that, and you'll just smile when you realize the logic of it, where in hindsight of course where everything is understandable. Don't anyone be hard on yourself about it - just smile instead and be happy! That's why I say this procedure is only really for advanced computer users who already get all these little computer nuances. I can see Krum that you are already an experienced computer user, just don't overthink it. Yes for 1709+ post #2 users, you will end up placing that file twice overwriting it - that is just the timeline of how things happened, just follow the directions in order and do as it says. Tested/Proven/Working hundreds of times by myself, and by thousands of users. You wrote this in two places but it does not make sense to me the way it's written: "msoe.dll\msoe.dll" ? ..also, naturally the x86 msoe.dll in that update is Only for Win10 x86 version OS and has nothing to do with x64 OS, as mentioned in tutorial x64 users don't touch the ''Programs Folder (x86)'' folder in any way. I'm trying to read and understand your instructions of what you did, it's confusing sorry, and why write it again, it's already written on the tutorial of what to do. Maybe it's just a language misunderstanding nuance, but things are complicated enough without making them more complicated <g> I know I know, you are just trying to be accurate. Have you personally ever had WinMail working (besides Win7) ..on any version of Win8 or Win10 yet? Yes, I have several installations of Windows 10 (but only 32-bit versions) with working WinMail (and many more with 64-bit architecture but only in Win7). Concerning the string "\Update_5-2018\x86 msoe.dll\msoe.dll" ... In the file Update_5-2018.zip (from post 1) there is a directory called Update_5-2018. Inside this folder there are two files (How to reinstate WinMail onto Windows 8 or Windows 10.url and install notes...txt) and two subfolders (x64 msoe.dll and x86 msoe.dll). The first of the subfolders contains a file msoe.dll (file size 2080768 b) and the second one also contains msoe.dll (file size 1616384). So i tried to say that I got the file Update_5-2018.zip\Update_5-2018\x64 msoe.dll\msoe.dll and placed it in C:\Program Files\Windows Mail\ and I did NOT copy Update_5-2018.zip\Update_5-2018\x86 msoe.dll\msoe.dll in C:\Program Files (x86)\Windows Mail\. I'm not a native speaker, but I feel that probably I irritated you somehow... Please, excuse me if I did it - I really just wanted to be more precise explaining what I did, hoping that you'll find my mistake. Edit: Hm... I'm starting to think that I really started with "wrong" (already manipulated .ISO) file... Could you please confirm if the file size of the correct .ISO file is 3.77 GB (4,056,717,312 bytes)? No I was not irritated and I apologize if it seemed that way. The process i thought is easy for advanced computer users..
..once a week or so I keep writing the same instructions over over again is all, but that's my issue to deal with. LoL ...maybe I need to keep my replies shorter ..I get carried away trying to give good details is all. I am here to help the best I can. ..my eyes go cross-eyed trying to read that file/folder target detail you wrote - but I get what you are trying to say, thanks. This process is really for you to figure out though, because the instructions are accurate, and it's for you (and everyone) to be their own WinMail tech support going forward. I'll Always be Happy to tweak wording in the instructions to make it better for everyone! You speak Great English btw, no worries, heck I wish i knew how to speak more than one language like you do! It's for you (everyone) to make sure they are using the correct iso files okay - that's not my purpose in this thread. I just gave you a hint about it because of the screenshot that Your Post talked about in Saaglem's post, where you said yours did not show WinMail listed like his did, and so naturally if his did then the question is why does yours not? Anyway, bottom line is for Win10 Enterprise LTSB/C official versions, if the tutorial was done correctly - WinMail Will Work ! Just out of curiosity I download and installed the free version of NTLite from their website, and took all 7 various versions of Win10 Enterprise LTSB/LTSC I have (includes current and previous versions) and loaded them into NTLite - and I noticed None of the Enterprise LTSB or LTSC versions have listed under the 'Windows Apps' tab, that other tab called 'Apps' that Saaglem's post shows ...which is where Windows Mail shows up along with a lot of others - the Apps tab is not even listed there at all.. However when I load regular Enterprise into NTLite, Yes the Apps tab is there with Windows Mail (and others) showing within it. When I load any other Win10 version besides Enterprise - Yes they all have the 'Apps' tab with Windows Mail (and others) too. Conclusion: is that for whatever reason NTLite does not show that 'Apps' tab and it's missing for any Enterprise LTSB or LTSC version loaded. I don't know why, yet, however that is not my focus in this project. I don't use NTLite anyway, but it does seem like a very fine program. For this WinMail project I will only use the the complete iso's that MS releases, and as I've shown that All official versions of Windows 10 are able to have WinMail reinstated, and that's only what this WinMail thread is about. It turns out that copying downloaded files from the tutorial with a 32-bit file manager is a realy bad idea. File Explorer is not comfortable for me, so I used x86 Total Commander. Switching to 64-bit version, repeating the steps once again and... Windows Mail is working! @ Endeavor - Thanks a lot for your help, for your time and support! Also for the tutorial in first two posts which keep this great program still working! "Details >>" or "<< Details". This panel has two looks: default compact with the progress indicator only and expanded with Tasks and Errors tabs. By default, it should not show the lower tabs when all operations were successful, and should switch to expanded only when some errors occurred or user switched it manually by pressing "Details >>". However, because of the bug, the expanded state, once it happened, cannot be switched back to default compact permanently. So, even if you press "<< Details" and the panel becomes compact, when you exit WM and launch it again, the panel will be opened expanded. You cannot change it to compact look by default after any single error happened. So, need to reset its default look manually by modifying the Registry (so I added that simple reg file). Another note from my experience: in the instruction (6) you suggest to copy the file msidcrl30.dll to System32 directory. I think this is a bit excessive, this file can be copied to Windows Mail directory instead like msoe.dll etc. Although on Windows 7 it's a system DLL, on Windows 8 it can be "demoted" and counted as local DLL because it is not used by any other system program. At least in my Windows 8.1 and without Calendar installed. Could you try the same on your systems, it would be interesting to know?